One of the year's most anticipated shows made the Canada Day long weekend that much better, as Soundgarden launched their 2011 reunion tour right here in Toronto. It had been exactly 14 years, 7 months, and 19 days since the grunge forefathers last saw these parts as a foursome, so needless to say their long awaited return was received with open arms packing a near capacity Molson Canadian Amphitheatre. For a show with as much hoopla as it had, surprisingly scalpers were cutting their losses by half, in desperation, trying to unload their extras at the door. The last time Soundgarden played Toronto was back on November 13, 1996 at the dreadful tin-can of a venue, Varsity Arena. With very little stage chatter, fans could feel the tension ricocheting from the stage the entire night. Most notably, the severe temper tantrums bassist Ben Sheppard displayed while playing with his back to the crowd, eventually smashing his instrument and kicking over amps. The writing was on the wall as it was just a few short months later that the band inevitably self imploded. Fast forward to 2011 and the difference between this and the '96 show were like night and day. 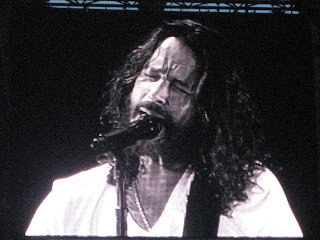 Chris Cornell had even been quoted in recent years that a Soundgarden reunion "just didn't make sense". Maybe it was the money or Cornell's failed attempt at hip-hop to get the wheels in motion. Regardless, clearly all differences have been put aside leaving room for a group out to have fun. Smiles could be seen beaming from all four members faces the entire night. Cornell was not shy giving guitarist Kim Thayill a hug on stage during band introductions setting the tone for an all out lovefest. Taking the stage right on cue, fog lights would have come in handy to cut the thick cloud of sweet leaf that began to rise even before Cornell had started the first verse of set opener, "Black Rain". Cornell even had family in tow as he introduced his young son side-stage who was air drumming along all night to the decorated stickwork of the ageless time keeper and full time Pearl Jam drummer, Matt Cameron. With a front loaded set list, the hits and fan favourites (along with a few obscurities) came one after another all night. A new album is apparently in the works for a release sometime next year, but nothing new or unfamiliar was represented giving the faithful everything they could have possibly asked for. The only questionable part of the evening might have came when the band left the stage before returning for the obligatory encore. Other than possibly "Pretty Noose" (which was surprisingly left off the set list), they left the audience in suspense of what could possibly be the nights send-off during the encore. In the end, not much was missed if you cut out early to beat the crowd. 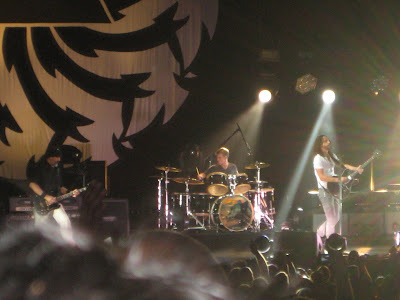 Sounding completely polished and tight a band as ever, evening highlights began with "Spoonman", third song in, followed by "Rusty Cage", "Blow Up The Outside World" with Cornell letting the audience sing ending chorus honours, "Fell On Black Days", "Black Hole Sun", and hands-down, evening highlight, "Outshined". With a mesmerizing video and light show from the stage, the audience was also treated to nature's lightshow as the rain came down with forks of lightning about half way through the night. Not an ideal situation if you had a lawn seat. So now you know, Toronto went home mystified, looking California and feeling Minnesota.